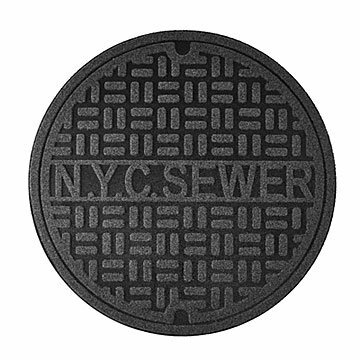 These playfully street smart indoor/outdoor floor mats are reproductions of NYC or Paris manhole covers. You don't need to live off the A train or have an arrondissement address to have some authentic New York or Paris in your pad. These playfully street smart indoor/outdoor floor mats are reproductions of real manhole covers from both cities (choose your favorite). Made of 100% recycled truck tires with durable nylon flocking, they bring gritty urban glamor right to your doorstep. Made in China.